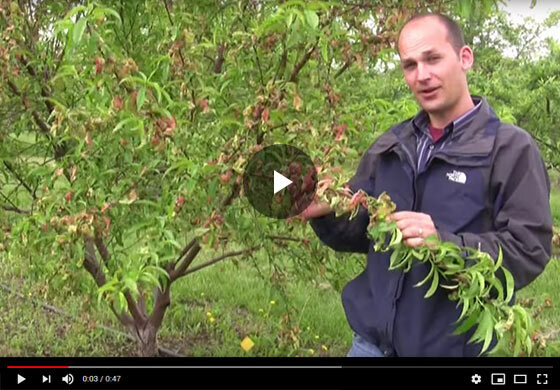 Join our expert Felix as he demonstrates the effects of peach leaf curl on a regular tree and on a TruGold tree which has excellent resistance to the infection. Folks, have you ever seen this on your peach trees? Doesn't look very good and this is peach leaf curl and in a very bad spring, we have lots of moisture like we did this year and if you didn't get your copper spray on with your dormant oil the fall prior or early spring, you can see this show up in a lot of peach varieties. And it really affects photosynthesis, it reduces vigor, not a good thing to see on your peaches and it's also a host den, you can get further spread, something you really don't want to see. Alright, so folks, I just wanted to show you, we've been really impressed with TruGold this year because it's a heavy peach leaf curl infestation in our peach block, we forgot our copper spray so we really felt the repercussions of that but TruGold here, all of our TruGold trees are almost completely immune to the peach leaf curl. We've seen just a tiny bit, if you compare this tree to the one we were just at, and it is really striking. So, if you don't want to put copper sprays on your peaches, this is the one for you.